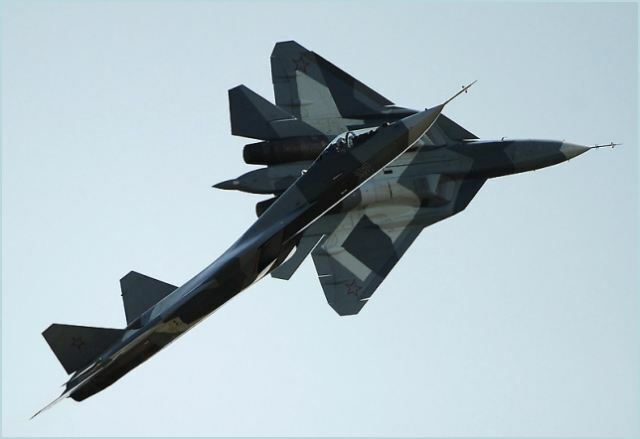 Russia's Sukhoi T-50 5th generation fighter performed its first demonstration flight at the MAKS 2011 International Aviation and Space Show in Zhukovsky, outside Moscow, on Wednesday, August 17, 2011. Russian officials said the final version of the jet will not be ready until the end of 2016. India was reported to be interested in up to 200 T-50 fighters for its air force while Russia was planning to order at least 150. The flight was observed by Russian Prime Minister Vladimir Putin and other dignitaries. Experts said the pilots had not performed any aerobatic stunts because the plane is still going through a series of test flights. The Sukhoi PAK FA T-50 is a twin-engine jet fighter being developed by Sukhoi OKB for the Russian Air Force. The current prototype is Sukhoi's T-50.The PAK FA, when fully developed, is intended to be the successor to the MiG-29 and Su-27 in the Russian inventory and serve as the basis of the Sukhoi/HAL FGFA being developed with India.